Your mission is to protect your tank and the base from the enemy tanks by destroying all enemy tanks. Player starts the game with 3 lives. 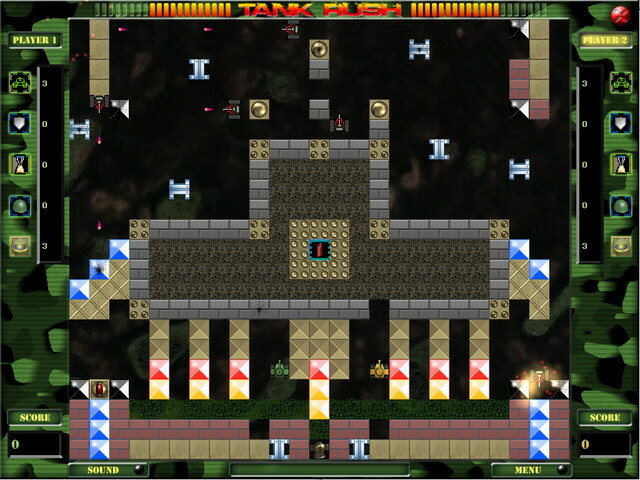 If the base or the player's tank is destroyed, the game ends and the player returns to the main menu. The number and diversity of enemy tanks increases based on difficulty level. If (easy) is chosen, enemy tanks move more randomly. When the players hit each other's tank, movement is temporarily frozen. After successful completion of the mission, another map is loaded and the game continues. Remaining lives are carried to the next level. Other capabilities of the tank are reset. When any 10 cards are passed, the player will get a little surprise! You'll get access to a new level named "Crazy." To beat this level, you'll need to crash all impenetrable blocks while the enemy appears from every direction. All bonuses earned by the player are retained when advancing to the next map. * Load maps created by special map editor "Map Creator for Tank Rush game" (included with game). * Choose any map from this list with Preview function. * Edit voices based on events. * Several sets of tank control keys for each player. * Play together on one keyboard against the computer. * Switch between full screen and window mode.